One of the stated purposes of the International Association for Near-Death Experiences (IANDS) is to support near-death experiencers (NDErs). The IANDS Bylaws state that one of its purposes is "To serve as a fraternal organization for those who have experienced such phenomena" (Article II, Purposes). Another, related, purpose of IANDS is to "Encourage the exchange of ideas and the communication of findings about near-death and related experiences" (Bylaws Article II, Purposes). 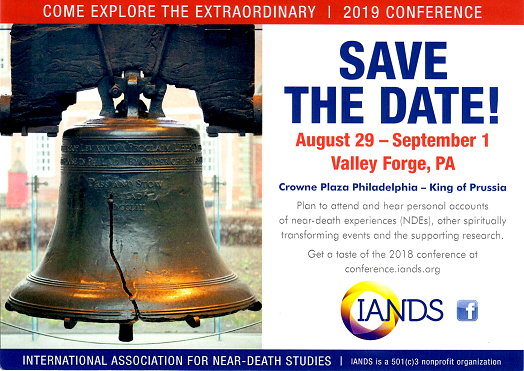 Supporting this purpose, an IANDS membership brochure states that IANDS is "To serve as a contact point and community for people with particular interest in near-death and related experiences." IANDS Affiliated Groups (Groups) are one of the major means by which these two IANDS purposes are carried out. Groups serve near-death experiencers by providing understanding and information to those who have had such experiences. Groups also offer education and discussion of near-death and related experiences to the general public in a supportive, accessible setting. IANDS Affiliated Groups may be formed to serve specific communities interested in near-death and related experiences. An Affiliated Group may be geographically based, such as a country, city or regional Group, or may serve an Internet or telephone connected community. The governance, control, bank accounts, and finances of Affiliated Groups shall be separate and distinct from those of IANDS itself. Any IANDS member may form an IANDS Affiliated Group and may obtain support in doing so from an IANDS Board member assigned to Groups. When an IANDS member proposes to form a Group in their community, they may contact the office to obtain the documents available to help start-up Groups, including IANDS Policies for Affiliated Groups, and to get contact information for the Board member(s) assigned to Groups. •1. The Group Leader must be an active IANDS member at the Supporting level or higher. •2. A proposed Group shall apply for affiliation status with IANDS in writing (may be by email), supplying IANDS with the name of the Group, the leader's name, address, telephone number and email address. Groups shall keep IANDS informed of any changes in their contact information or of termination of the Group or of its affiliation status. •3. The Group shall agree to operate in harmony with the mission and purposes of IANDS, to focus primarily on the NDE and similar experiences, and to follow IANDS Policies for Affiliated Groups. •4. The Group shall agree to be open to people of all backgrounds, beliefs, and views and to not proselytize any single interpretation of near-death experiences or point of view. •5. The Group shall agree not to engage in legislative (lobbying) or political activities using the IANDS name (as this would jeopardize the IANDS tax exempt status) and shall agree not to otherwise bring harm to IANDS, its name, or its Groups. •6. The Group shall make every effort to assure that all people will be safe at their meetings, and therefore shall agree not to offer instruction in any procedure that mimics the NDE or any of its aspects during their meetings. •7. To be designated as an "IANDS Affiliate Group" in good standing, a group will submit the group affiliation fee of $50.00 with a completed group organizational request form pledging adherence to IANDS policies as described herein. •8. Thereafter, by August first of each year the group shall maintain affiliation status in good standing by submitting the annual affiliation renewal fee of $50 ($75 for Groups that are part of the IRS exemption), accompanied by an annual group status report including up-to-date group leadership and contact information. •1. Grant affiliation, in writing, to the Group. •2. Provide a start-up packet to the leader(s), list the Group on the IANDS web site, and provide mentoring for new Group leaders, if desired. •3. Invite the Group leader(s) to take part in annual Leaders Seminars, monthly conference calls, and periodic selection of a Board Member at Large for Groups (BMLG), if and when such are conducted. •4. Provide back issues of Vital Signs, other printed brochures and pamphlets, if desired by the Group, as long as supplies last, as samples for Group attendees. •5. Group leaders and their representatives are invited to join the IANDS Group Leaders Network website to share with and gain experience from existing groups participating in this online tool sponsored by IANDS. While it is understood that IANDS Affiliated Groups are separate financial entities from IANDS, Groups are encouraged to contribute a portion of their proceeds to IANDS for the operating expenses of the international offices and for IANDS program outreach, including that outreach which supports Groups. Periodic donations are welcomed in any amount. In addition, Groups are encouraged to provide information to their attendees on how to join IANDS and how to take advantage of other IANDS programs, including the annual conference and the web site. A US-based IANDS Group may elect to join IANDS’ IRS Exemption Letter. An IRS group exemption allows a central organization (IANDS) to include subordinate organizations (our Groups) under its 501(c)(3) IRS tax exemption. If an IANDS Group is included under IANDS’ exemption, the Group may receive tax-deductible donations. IANDS was granted Exemption status on August 29, 2014 with IRS Group Exemption Number 6038 . 1. Have been active as a Group for at least the last 12 months. 2. Be organized and operated within the United States, not be a private foundation, and not already have an IRS tax exemption. 3. Be under IANDS’ general supervision or control. This means that the IANDS Group completes its Annual Affiliation renewal each year and adheres to IANDS policies and the requirements for IRS group exemption. These requirements include, for example, having a separate checking account for the Group and sending out appropriate, timely acknowledgment letters for donations received. The official name of the Group and its employer identification number or EIN (apply for one using Form SS-4 or via the Internet). Agreement to adhere to IANDS policies and the requirements for IRS exemption. A statement authorizing IANDS to include the Group under the IANDS exemption. An application fee of $75 payable to IANDS. This fee is needed to help offset the cost to IANDS of the initial $3,000 application fee to establish the IRS group exemption. 5. File an annual 990 tax return by May 15. For Groups that normally have gross receipts of $50,000 or less, the 990 form is a simple on-line e-Postcard 990-N. This form requires simply entering the Group’s identifying information, entering the IANDS Exemption Number of 6038, and confirming that the organization’s annual gross receipts are $50,000 or less for the tax year. In addition, if the Group earns more than $1,000 per year in "unrelated business income " (e.g., from Internet advertising), the Group will need to file Form 990-T Exempt Organization Business Income Tax. 6. Maintain affiliation status in good standing by submitting the annual affiliation renewal fee of $75, accompanied by an annual group status report including up-to-date group leadership and contact information. Some additional information will be required for tax-exempt Groups. The purposes of an IANDS Group are (1) to serve near-death experiencers by providing understanding and information to those who have had such experiences and (2) to offer education and discussion of near-death and related experiences to the general public in a supportive, accessible setting. The IANDS Group’s activities may include (1) holding periodic meetings open to Group members and the public, dealing with near-death and related experiences, (2) advertising the periodic meetings through various media and mailings, and via an Internet web site, (3) inviting outside speakers to speak at Group meetings, (4) distributing information and selling books and DVDs about near-death and related experiences and other related topics, and (5) collecting admission fees and donations to cover the expenses of these activities. The IANDS Group’s activities shall conform to the mission and purposes of IANDS, shall focus primarily on the NDE and similar experiences, and shall follow IANDS Policies for Affiliated Groups. The Group’s purposes shall not exceed IANDS’ tax-exempt purposes and its activities shall be within the scope of IANDS’ permitted tax-exempt activities. The Group will select a designated Group Leader and one or more Assistant Group Leaders to organize and conduct the Group’s activities. The Group will adhere to common accounting practices: the Group's fiscal year will be January through December, the Group will manage cash funds separate from any personal funds, and the Group will restrict the use of all Group funds solely to the Group's permitted activities. Having a separate checking account in the Group’s name, so that funds are managed separately from any personal funds and donations can be made out to the Group directly. (Free checking accounts can be obtained through some banks and credit unions. For example, check FindABetterBank.com). Adhering to common accounting practices: using the fiscal year January through December, managing cash funds separately from any personal funds, recording cash transactions from time to time in the checking account, restricting the use of all Group funds to activities supporting the Group, and so on. Sending out appropriate, timely acknowledgment letters for donations received. Collect and approve applications from new Groups wishing to be included in the IANDS exemption. Collect and review the Annual Affiliation renewals from all IANDS Groups. File an annual report with the IRS by October 1 of each year listing the IANDS Groups in its IRS group exemption, including those Groups that have been dropped and those that have been added. Joining the IANDS exemption involves some additional work and additional expense for the Group and for the IANDS staff. On the other hand, joining allows the Group to receive tax-deductible donations which will strengthen the Group’s work. Joining the exemption is completely optional and a Group may elect to join at any time or to drop out of the exemption. A Group will be dropped from the IANDS exemption if it does not fulfill the requirements listed in A. and C. above. To apply to join the IANDS exemption: Application to join the IANDS exemption (member login required).